•You can significantly improve the performance of ArcMap by building a spatial index for your data. RivEX will try to do this for you if it sees that your dataset is without a spatial index. This process can fail (e.g. the file was schema locked by another application) so you may want to build these indices independently. •You can tell if your dataset has a spatial index by opening the attribute table of the the dataset and looking at the field header for the Shape field. If you see a small asterisk then it has a spatial index. •Performance can also be improved with attribute indices. Indices can be built by calling the appropriate Geo-processing tool or using ArcCatalog. 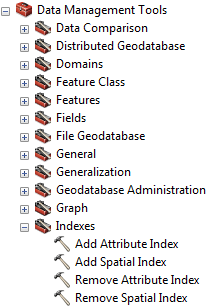 •If your data is stored as a Geodatabase FeatureClass then you do not need to build a spatial index, this is already handled by the Geodatabase but you may want to consider building attribute indices. •The easiest way to add spatial and attribute indices is to use the geo-processing tools. More information about these tools can be found here.